So, you’re planning a trip to Walt Disney World, but you’re too far away to make a road trip to Orlando. Air travel can be stressful, no matter where you’re going. Despite how easy flying seems in Peter Pan, the only way to fly to Disney World is through buying an airline ticket, which is a lot more expensive than pixie dust. If you want your Disney World vacation to be magical instead of stressful from the very beginning, you’ve come to the right place. 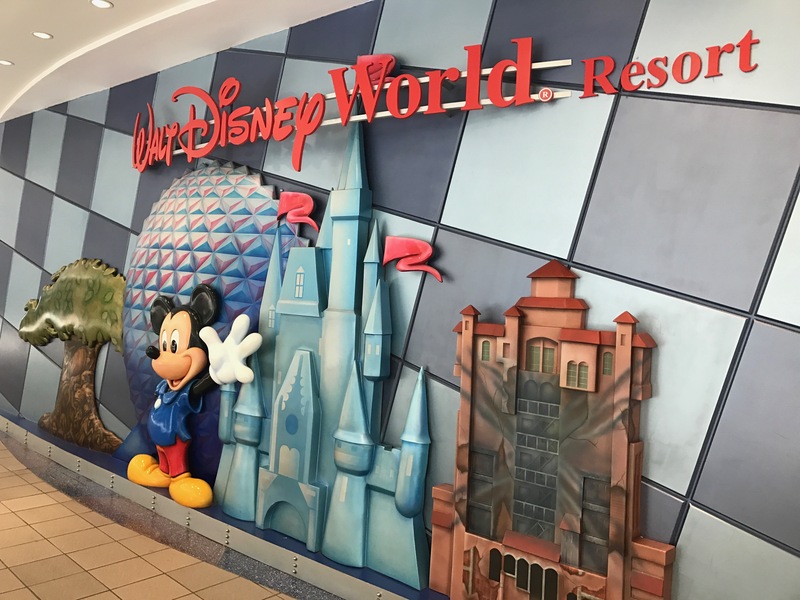 This comprehensive air travel guide to Walt Disney World will take you through everything: when to buy your ticket, what to pack, and how to get from the airport to Disney World. Ready to fly? Away we go! Where will I be flying to? The closest and most convenient airport for Disney World is Orlando International Airport (MCO). There’s even a pretty neat Disney store inside the airport! What airline should I fly? When should I buy a ticket? There is no universal answer for this, as this depends on what airport is close to you and if you have an airline you prefer to fly with due to rewards. However, conventional wisdom is that you should book your flight between 105 and 21 days before your trip – about 3.5 months – 3 weeks ahead of time. While I typically fly Delta due to their rewards program, I also now always use an app called Hopper (available for iOS and Android). You put in the dates of your trip and your destination, and Hopper will automatically send you alerts on when ticket prices are good for that trip. They make it really easy to purchase tickets through the app. While I don’t use it for every single flight I’ve gone on, I’ve already saved a few hundred dollars just by using Hopper. It’s a great tool for finding the right time to buy a flight. Packing for a vacation when you’re flying can be very stressful. There’s so much to consider, like the weight limit (typically 50 lbs per bag), how much it costs to check a bag (typically $25-$35 for the first bag depending on the airline, however some airlines like Delta will waive the fee if you have their rewards credit card), and what you items you should bring on with you during the flight. The following items are great for air travel in general, but I’ve sprinkled some Disney flair among the items. They might not make flying any easier, but they might make it a bit more fun. Note: For more ideas on what to bring on your vacation, check out our list of Essential Items to Pack for Walt Disney World! A Good Set of Luggage – Depending on the length of your trip, you may be able to manage traveling with just a carryon bag. However, most people will need a carryon bag and a checked bag to accommodate all of the items they need for a week-long trip to Orlando. I recently upgraded my luggage to this Samsonite StackIt luggage set, which includes a carryon bag and a checked bag. The best part of this luggage is that the carryon bag has a loop on the back that lets you stack it on top of the checked bag, which makes navigating an airport with 2+ bags much easier. If you’re looking for other options, I definitely recommend going with a bag with spinner wheels. This might not seem like a big deal, but having a carryon that I can easily get through the aisles of an airplane makes a huge difference. This other Samsonite Ultralie Extreme 2 Piece Softside Spinner luggage set is well reviewed and reasonably priced. For a more budget pick, this 3 piece spinner set from American Tourister is a bargain, and you can save extra money if you don’t mind going with blue luggage. TSA compliant luggage lock – A luggage lock is a great investment, even just for the peace of mind. An added benefit of a luggage lock is that it allows you to lock up large valuables in your hotel room. If you are using a luggage lock on your checked baggage, the lock must be TSA compliant. This pack of 4 TSA compliant locks will be enough for most families. Packing Cubes – As I’ve said before in my essential packing list, I LOVE packing cubes. They help keep me organized, and they help save space in my suitcase. The latter is a definite must when packing for a flight. I originally got one set of packing cubes, and I’m about to get another. This pack of 4 Amazon Basics packing cubes is a great deal. TSA Compliant Toiletry Bag – The TSA has a rule for liquids known as the 3-1-1 rule. You are allowed to bring 1 quart sized bag of liquids, aerosols, gels, creams and pastes in your carryon bag, all that have to be in containers under 3.4 ounces. Usually, my strategy for toiletries is to just put them in my checked baggage, as this avoids having to take my toiletry bag out at the security checkpoint. However, if that’s not an option, this clear cosmetic bag is a great idea for making things easy for yourself as you work your way through security. Travel Pillow – Airlines seats aren’t exactly famous for being comfy, so you’re gonna want to increase your in-flight coziness with a neck pillow. Here are a few options, from your standard pillow to a few fun Disney-themed pillows. There’s even a Haunted Mansion neck pillow for the Disney World diehards! Eye Mask – Sleeping on a flight can be a challenge, so having an eye mask is essential if you want to catch a few z’s while you’re on your way to Orlando. This is even more crucial on red eye flights, where they will dim the cabin’s lights, but there is always still a bit of light remaining in the cabin. Imagine Ink Mess Free Coloring/Game Book – if you’re traveling with small children, these mess free coloring books are a LIFE SAVER. The “Magic Ink” marker is a clear marker that only will add color to pages in the book, not to your child’s clothes or your skin. My niece and nephew (age 2 and 5) instantly become engrossed with these coloring books. It’s not only great for plane rides, but for restaurants and waiting areas. Tablet – I remember the old days of being limited to the airline’s lineup of in-flight entertainment. That only lead me to watching a lot of mediocre movies (I’m looking at you “The Tooth Fairy” starring Dwayne “The Rock” Johnson) and sitting in boredom. Luckily, technology has made that a thing of the past. A tablet is my best friend on a long plane ride. I can watch a movie, play games, read a book, or listen to music/podcasts without having to pack a ton of extra items. My current go-to tables are the iPad, which does pretty much everything, and the Nintendo Switch, which has some fantastic games like Zelda: Breath of the Wild and Mario Kart 8. No matter what tablet you get, it’s a great way to make the hours in the air go by quicker. Headphones – Whether you’re using your phone, tablet, or the in-flight entertainment system, headphones are an absolute must. Most likely, you already have a pair of headphones that you like. Here are a couple of recommendations for headphones that are good for planes. First, the CozyPhones Sleep Headphones are made for comfort. While the sound isn’t anything to write home about, they are perfect if you want to doze off during the flight. My personal choice of headphones are the Bose SoundLink around ear wireless headphones. They have great sound, and they block out surrounding noise without being noise cancelling (which I personally don’t love). If noise cancelling is a must for you, here is the noise cancelling version of the Bose Headphones, which costs a bit more. Disney World Books – I find that reading is another great way to pass the time on a long flight. What better way to get excited for your imminent Disney World vacation than to pick up a book about the most magical place on Earth? 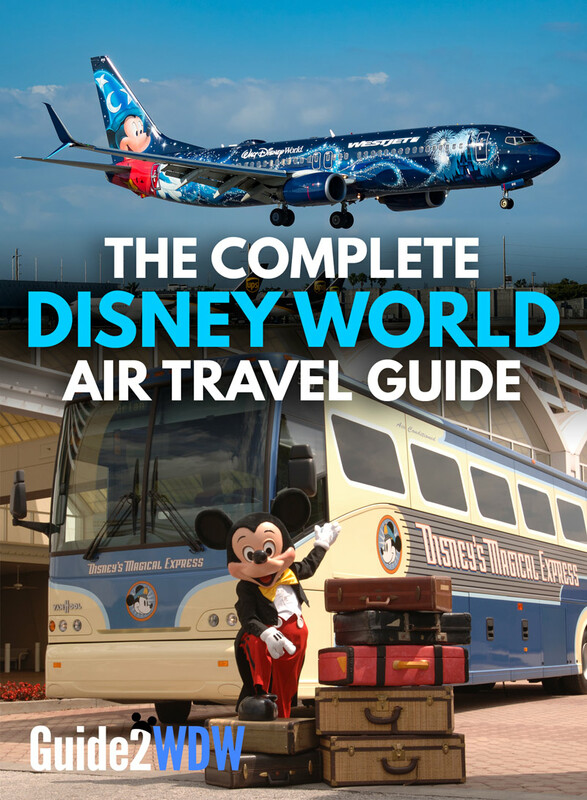 Whether you want a guide book that informs you about all the attractions and restaurants or a book with interesting facts about Walt Disney World, the following books will help you appreciate your Disney World trip even more. Note: Anything that is an absolute must for you when you fly to Disney World that is missing from this list? Let me know in the comments below, and I’ll add your suggestion and give you a shout out. What about Disney’s Magical Express? Disney’s Magical Express is Disney’s shuttle to and from the airport. If you are staying at an official Walt Disney World resort (any of the hotels owned by Disney), then you have free access to Magical Express. If you’re not renting a car, this is a great perk to take advantage of, since free airport transportation will easily save you over $100 round trip. Important: You do have to reserve your Magical Express ride before you arrive in Orlando. Once you have your Disney resort reservation, you can reserve online or call these numbers to reserve your Magical Express ride: U.S. and Canada Reservations: (407) 939-1936. United Kingdom Reservations: 0800 16 90 730. If you booked your vacation through a travel agent, they should be able to set up your Magical Express ride for you. Another fantastic perk of Magical Express is that you don’t need to bother with baggage claim when you arrive in Orlando. 2-3 weeks before your trip, Disney will send you luggage tags. Attach these to any luggage you’ll be checking. Disney will pick these bags up from the airport and deliver them to your room. As someone who has spent countless hours waiting for my bags to arrive on the carousel at the airport, this actually does feel like magic. If you’re staying at a Disney Resort, your Magic Band will act as your park ticket and your room key. If you’re using Magical Express, your Magic Band lets you check into the motor coach (Magical Express documents will also work). Just in general, it’s a good idea to just keep your Magic Bands in your carryon bag, as it will help you get into the parks quicker and avoid headaches in case you’re separated from your checked luggage. It’s also a good idea to never pack your valuable or necessary items in your checked luggage. It depends. If you’re staying at a Disney World hotel and don’t plan on doing anything off Disney property, you can rely on Disney transportation for pretty much your entire vacation. This is what I personally do when I fly into Disney World, just because it’s the easiest option. 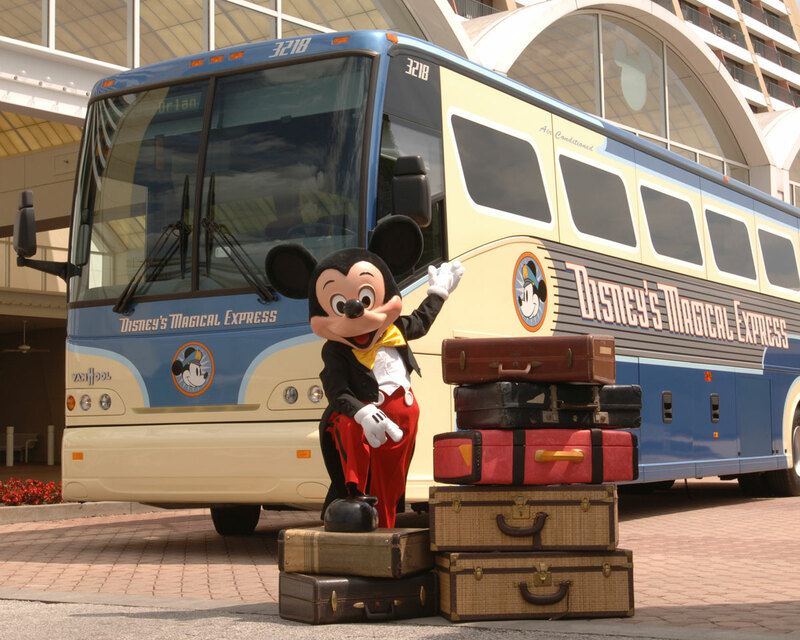 However, a rental car can save you time spent waiting on the Disney buses that will shuttle you from the resort to the parks or Disney Springs. There are a couple of scenarios where a rental car makes a lot of sense. If you’re staying off Disney property, your transportation options will be much more limited without a rental car. Many neighboring hotels will offer transportation to the Disney World parks, but these shuttles typically run much less frequently than Disney’s buses. For example, when I stayed at the Waldorf Astoria, their shuttle ran pretty much once an hour. If you’re planning on spending a significant portion of your trip enjoying Orlando’s other attractions like the Wizarding World of Harry Potter at Universal Studios, then having a rental car will give you a lot more flexibility to spend time away from Disney. In the last couple of years, ride sharing apps like Uber and Lyft have become much more viable options to use in lieu of a rental car. In some cases, it makes much more sense to rely on these to get around. For example, if you’re staying on Disney property, but you’re planning on spending one day at Universal, it will be much cheaper to pay for the roundtrip Uber rather than renting a car. Tip: Use Amazon Prime to send bulky items that are hard to fly with to your hotel. One disadvantage to flying vs. driving is that it is much harder to pack a case of water bottles or a box of cereal. They just weigh too much or take up too much space. However, there is a solution! Order bulky items like water bottles, cereal, granola bars, or other groceries via Amazon Prime. Even if you are renting a car, this will save you a trip to the grocery store, aka valuable time. 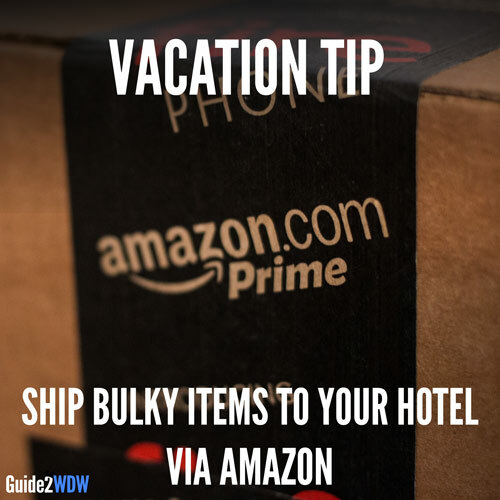 Check out our article about using Amazon Prime to ship groceries to your hotel here. Most Disney hotels do not charge a fee to have a delivery sent to your room. However, hotels like the Swan and Dolphin do, so be sure to check beforehand. Why Amazon Prime? You can also use other grocery delivery services like Instacart (which is great), but if you have an Amazon Prime membership, shipping will be free. With a little bit of planning ahead, you can time your shipment to come in on the first day of your vacation. If you don’t have an Amazon Prime membership, you can get a free 30 day trial here: Try Amazon Prime 30-Day Free Trial . That wraps up our comprehensive Disney World air travel guide! Let me know if you have any questions or suggestions. I’d love to hear your Disney World travel stories. Let me know on Facebook or in the comments below! Disney plane picture by Venkat Mangudi, used under Creative Commons license.